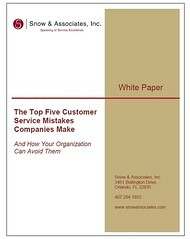 I've recently put together a white paper titled, "The Top Five Customer Service Mistakes Companies Make, and How Your Organization Can Avoid Them." The mistakes addressed in the white paper come from working with and observing hundreds of organizations, large and small, and noting the issues that seem to come up again and again. My purpose in writing the paper, however, was not to simply point out the mistakes. For each of the five issues addressed, I've offered approaches for avoiding the mistake or for making course corrections if things have gotten off track. Not clearly defining what the customer experience is supposed to be. Designing processes for the company's convenience, not the customer's. Not making customer service a significant part of new-hire orientation as well as ongoing training. Tolerating poor service performance from employees at any level within the organization. To download the white paper, simply go to my website, www.snowassociates.com, scroll to the bottom of the page and fill in the requested information, and then click the subscribe button. Be sure and let me know if you have any problems with the download. Please forward this post to anyone you feel might benefit from the information provided in the white paper. And I would welcome any feedback, pro or con, you might have based on what you read.